How many people have travelled to the United States over the centuries, hoping to live the American dream? It is the Holy Grail for so many, and often as unattainable as the pot of gold at the rainbow’s end. Jende Jonga and his wife Nemi are a Cameroonian couple who come to New York in search of a better life. But although Jende has papers that allow him to work and Neni is studying to be a pharmacist, their request for asylum has still not been granted. Jende gets a job as a driver with Clark Edwards, a director at Lehman Brothers. Meanwhile, Nemi works for Clark’s wife, Cindy, when she needs extra help. The lives of the two couples intertwine with the Jongas being privy to the Edwards’ secrets. Their marriage seems perfect on the surface, but it is starting to fall apart. Lehman Brothers is on the verge of collapse, and Clark’s job is at stake. With the fall of the company, things come to a head, with far-reaching consequences for all of them. By portraying two families on either side of the social divide, Imbolo Mbue highlights the contrasts and the parallels between the two worlds. The contrast is set up in the first three pages of the book, when Jende goes to Clark’s office for a job interview. He is nervous: so much depends on Clark hiring him. Jende has got himself a new suit and a resumé, which a volunteer career consultant had written for him. But when he is shown into Clark’s office, Clark barely looks up from the shredder: for him, Jende is yet another applicant. This debut novel from Mbue, a Cameroonian writer, is impressive. 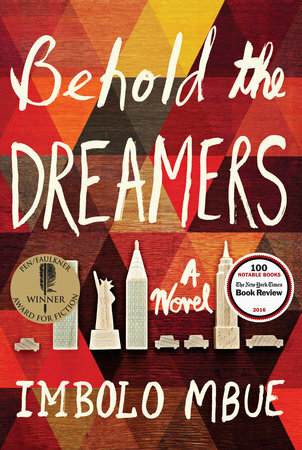 It is well-written and perceptive, not just about the immigrant experience but more generally about human nature. The characters are all too real and drawn with empathy: no one is evil or purely good. This is much-needed book, especially at a time when it has become easy to judge others without taking the time to listen to their stories. It is a reminder that we all have stories.